Similar to Blood Orange or Fool’s Gold, their smooth blend of flutes and synth is infectious. 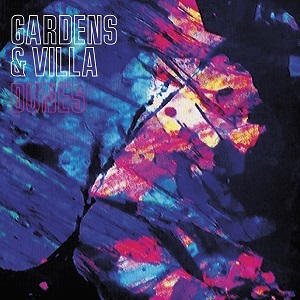 Fans have been waiting for a few years for Gardens & Villa to release a second album and finally Dunes is here, and we love it. Dunes sounds similar to their first album, full of flute and beachy harmonies – but it clearly has more direction. The chords seem more intentional, the guitar is more purposed. If anything, they’ve come back with a stronger vibe. The opening track “Domino” sounds tropical and relaxing. It begins with almost elevator music synths, but they end up fitting well with the track. Another gem is “Chrysanthemums”, which is airy and slightly reminiscent of a Dirty Projectors song. High-pitched harmonies float over piano chords, making it a nice break from the synthesizers used in most of the other tracks. “Thunder Glove” is another solid song that sounds like the opening to an 80s car chase movie. The heavy synth opens up to light vocals and taut guitars. “Thunder Glove” is easily one of our favorites on the album. On the whole, Dunes is a solid second album, one you can listen to all the way through without skipping any tracks. It will make you love flute like you never thought you would.